While some people might think of the Cannes Film Festival as a place where serious filmmakers come to shill while sipping champagne on glamorous patios, it’s also a place where, shall we say, less prestigious movies also come to nab attention. Case in point: The Emoji Movie, which is currently laying its adorable tentacles all over the south of France. 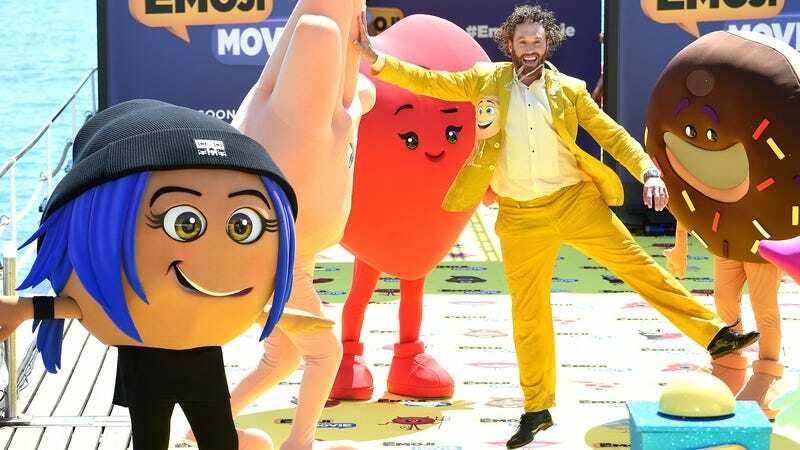 In a stunt held earlier today, T.J. Miller—one of the film’s stars— parasailed into a press conference held on a Emoji-themed pier near the historic Carlton Hotel, while the film’s studio live-streamed the whole thing. That might sound awkward, but in practice, it was even more cringeworthy, with Miller harnessing his awkward intensity into yelling at his boat captain while he was up in the air, managing to flip himself over, and then trying to drum up support for his movie while giving a speech in front of people dressed as comically large, cheery, dancing emoji. Miller’s bit starts at about 4:25 in the clip above, and it’s well worth a viewing or 20. The Emoji Movie is out July 28, and the trailer, which Paste says “definitely appears to be [for] a film of some kind,” is below.